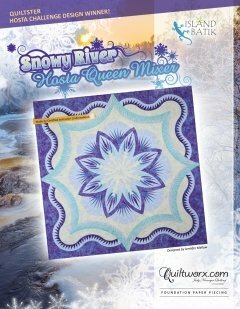 Snowy River Hosta, Hosta Queen Mixer Quilt, designed by Judy and Brad Niemeyer for Quiltworx. Hosta Challenge Design Winner. A sewing technique called foundation paper piecing is used to assemble the units required to make this quilt. Quilt measures 100" X 100". Only 500 of these patterns will be available. We also have kits available using the Island Batik fabrics used on the model.